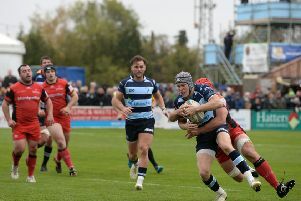 Bedford Blues fans turned out in their hundreds on Saturday afternoon to say a final farewell to stalwart Mike Howard who signed off his tenure at the club with a high scoring testimonial encounter. Blues past and present put on a fine display of running rugby with an 80-70 victory to the star attraction’s Legends side. There were only a couple of minutes on the clock when Bedford opened the scoring thanks to a Ryan Hutler effort which was converted by Camilo Parilli-Ocampo. The Legends having plenty of early ball as Mark Kohler, James Pritchard and Brendan Burke went on the attack but the Blues defended well. Bedford’s defence did buckle soon after as Conor Tupai – who was playing alongside his dad Paul – made a superb break and played in Henry Staff for the score which Jake Sharp converted. The Legends showed their experience to scored two more quick tries with the first coming from a great run by Brett Daynes with Gregor Gillanders in support. Further phases followed before Burke and Pritchard linked up to play in Corey Hircock. Moments later, Tupai junior crossed the white wash following some fine juggling by Chris Locke who then pulled off an outrageous pass to play in the 17-year-old. It was certainly Champagne rugby from the Legends and they made it 22-7 when Hircock went over for his second in the 22nd minute and this was quickly followed up with another as the young Tupai played in Burke. Back came the Blues those who made full use of the slope as Joe Britton ran in and once again, Parilli-Ocampo converted. With the tide turning a little, Phil Bowden used his pace to round Nick Walshe to score. At 27-19, the Legends had one final flurry before the break as Heath Stevens and Kohler combined with the latter going over to make it 32-19 at the interval. There was no let up from the Legends after the break as Hircock drew in the last defender before popping the ball to the supporting Staff to make it 19-37. Sacha Harding gave a reminder of his full throttle tackling technique to deny the Blues a scoring chance, but the home team pulled a try back moments later when strength and conditioning coach Sean Vine displayed some smart footballing skills to kick through with Bowden dotting down again. The Legends continued to keep the Blues at arms-length and they stretched the lead to 42-24 when Dan Seal charged over the line from distance. The next try for the Legends probably got the biggest cheer of the afternoon as the testimonial man got his name on the scoresheet. Having collected the ball midway in the Blues half, Howard went on an arching run to beat the last man and score with Gillanders adding the extras to make it 49-24. The younger Tupai linked up well with Pritchard and Ryan Owen to play in Stevens with the extras being added to make it 56-24. It appeared that referee Darren Gamage was keen to let play flow by ignoring many of the laws of the game and it certainly helped as the Blues scored again. Hutler showed some nifty skills down the left wing to chip and collect as he scored his second but Dan George couldn’t convert. The Legends then fired back with another Conor Tupai try. Jacob Fields was then the beneficiary moments later as Parilli-Ocampo made a surging run down the wing before playing the ball to the supporting Fields who made it 61-34. Hutler scampered over the line for another try with Parilli-Ocampo making it three conversions from three, before Ed Taylor ran through to score and then convert his own effort to make it 61-48. Pritchard showed plenty of nous for the Legends as he calmly flicked the ball out the attacking Bowden’s hands before setting up an attack which saw Stevens crossing the line for a converted score. Kohler and Nico Steenkamp then combined well to play in Gillanders who converted his own effort to make it 75-48. Back came the Blues with an Ed Taylor grubber finding full back Joe Green with Burns converting before Charley Robinson drove over from close range. Stevens crossing for the Legends before a quick penalty allowed Green to run in a second and then he wrapped up a hat-trick to round off proceedings for the afternoon and indeed, the season.